Hire better job candidates and decrease turnover rates with video interviewing. With today's busy schedules, it can be difficult to get job applicants in for a face-to-face interview. A face-to-face interview allows you to see the whole picture. Online video interviewing has changed the way employers conduct interviews. 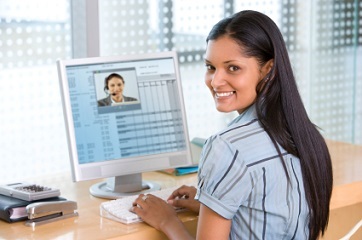 One of the most important benefits of video interviewing is the ease in scheduling. This service takes a huge burden of scheduling off the shoulders of your hiring personnel. The online video interviewing process also gives you a chance to get to know each applicant. No one can tell their entire story on a resume; some job seekers are too modest and downplay their achievements, while others may embellish their accomplishments. Video interviewing allows you to ask questions and get candid answers. Many job seekers may also be nervous in a face-to-face interview, so you don't get a true picture of their real personality. This software allows applicants to sit through practice questions and relax so they can put their best face forward. Once they get to the actual interview, they are calm and ready to answer questions with ease. Depending on which service you choose to use, the software will also relieve you of the burden of compiling lists of interview questions. Many hiring personnel have trouble creating questions that help them get a complete picture of a job applicant's personality, education and experience. With the “Full Service” version you can combat those issues by creating pre-approved video interview question sets. IF you like to play it a little more loosely though take advantage of the “Interview As You Go” option which allows you to create questions on the fly. By using this video interviewing software, your company will save money, and your HR department will save time. You will be able to make more informed decisions about job applicants before guiding them through the final hiring process. See a candidates’ 60 second introduction and like them? Simply fill out a quick set of 5 additional questions you would like for them to answer in a Virtual Interview and enter your credit card information. If the candidate accepts your request to take the interview you will be charged $12. If they decline you will not be charged. Once they have completed the interview, you will receive an email notification with a link to review the interview! Or, if you have a job listing with us, choose to require candidates to create a 60 second video introduction to include with their application to your job. Again, upon review of the video, if you would like to know more about the candidate you will have the opportunity to request they complete a Virtual Interview for you. Interview4, by Hire-Intelligence, is the only product that allows you to utilize three types of video interviewing techniques: One-Way Virtual Interviews, One-Way Virtual Showcase Interviews and Two-Way Live Interviews. Click here for more information about Interview4 virtual interview types. With this full version of Interview4 you can create custom question sets and email templates; track usage; comment,rate and score candidates; collaborate with your clients and hiring managers; and easily keeping track of all of your candidates in one site. They will even custom brand the site to look like yours or integrate with your ATS.